Interviews are an important part of recruitment process. There you have to compete with people who may have excellent communication skills. Fluency matters a lot in speaking. The following points may be kept in mind to improve fluency. 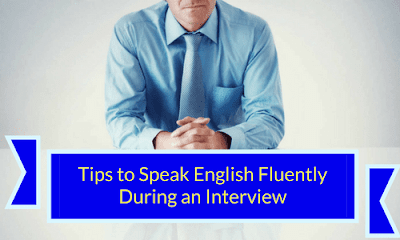 Many people think that if they speak quickly, they will be considered to have good fluency. However, it is not true. You should speak at a steady pace in the same way as you speak in your native language. The way of speaking should neither be too fast nor too slow. Speaking too slow should also be avoided because the listener can get lost in your ideas. Smoothness - This is related to pauses, repetition, silences and self- corrections. All these hinder the smoothness. So you should avoid long pauses and avoid repeating yourself. Flow - This is the ability of a person to give answers at length. You should avoid giving one word or short answers. Coherence- This is about maintaining logical order while speaking. It's about an organization of your ideas so that you can be properly understood. However, they should sound natural and don’t overuse them. Don't think too much about tenses and grammar rules as this affects fluency. If you are weak in English grammar, try to make short and simple sentences. In this way, you would make fewer errors and would be able to explain your point clearly. You can also avoid perfect tenses and perfect continuous tenses as they are difficult to use. You can have an advantage if you have a good vocabulary. However, don't use those words whose meaning is doubtful or you find difficult to pronounce as this can affect your confidence as well as fluency. So, just remember you have to use right word at the right time. There is no need to copy the accent of native speakers of the English. All the accents are usually acceptable. Imitation of an accent of others only increases difficulty while speaking and it also sounds unnatural.